Monday morning started with a joint session with the students from the Negotiation and Mediation Academy, which was being held for the first time. Both Academies would discuss the same case. The big question was, who would be most successful in solving the famous dispute between NedTrans and ALT? We, the students from the Arbitration Academy, were immediately split up into Claimants and Respondents. 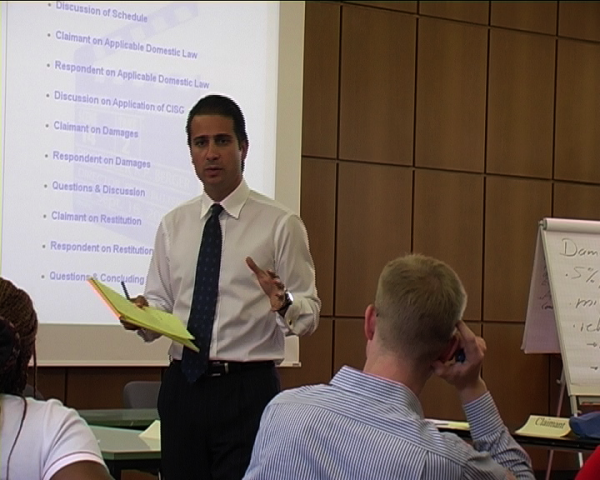 Since this Academy is not just about gaining knowledge, but especially about learning skills, we would actually go trough an arbitration procedure. Professor Berger and Isabel Mulder from DIS helped to put us on the right track. A fine selection of real-life "pathological" arbitration clauses was presented to teach us what not to do. Further we were guided over the hurdles of initiating the proceedings and appointing an appropriate tribunal. Stefan Hoffmann introduced the "good facts/bad facts" analysis, so each side could prepare its tactics for the next day. In the evening there was a guided city tour. The guide took us back to the time when a tribunal would sit in front of the south-gate of the Dom and the average judgment would involve some kind of bloodshed. Nothing like that would have happened to us had we lived back then though, since on Tuesday Constantine Partasides taught us all tips and tricks in the noble art of persuasion and oral advocacy. Some volunteers immediately had the opportunity to test their skills on our very strict, but also very efficient Tribunal. No-one had to be persuaded to join for the boat trip on the river Rhine that took place in the evening. After some lovely hours of sitting on the deck with excellent food and a pint of Kölsch, everyone agreed with Martin Hunter that this was far more enjoyable than a BBQ. While the temperatures kept rising, the proceedings got more and more hard-fought. Professor Hunter taught us how to get witnesses to say what we want without using "special techniques" and to obtain documents without using the infamous "D-word". On Thursday the arbitration came to an end under the lead of professor Raeschke-Kessler who revealed the hidden traps in setting aside and enforcement proceedings. In a final joint session professor Berger built a bridge between both Academies and showed how these techniques of dispute resolution can be combined. With an impressive binder, two textbooks, DVD and certificate in our suitcase, newly-gained knowledge in our head and skills in our fingers, we agreed to meet again soon in some luxury hotel for a real-life arbitration.